We’d love your help. 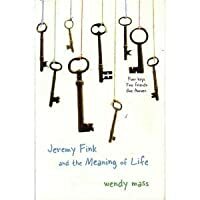 Let us know what’s wrong with this preview of Jeremy Fink and the Meaning of Life by Wendy Mass. Jeremy's summ In one month Jeremy Fink will turn thirteen. But does he have what it takes to be a teenager? He collects mutant candy, he won't venture more than four blocks from his apartment if he can help it, and he definitely doesn't like surprises. On the other hand, his best friend, Lizzy, isn't afraid of anything, even if that might get her into trouble now and then. To ask other readers questions about Jeremy Fink and the Meaning of Life, please sign up. Quinn The meaning of life, the universe, and everything is 42. Is this a christian book? A waft of poignant feel of losing the loved one runs through the entire book. It’s delightful, yet I felt somewhat bittersweet vibe in this book and I absolutely adored it. This is a story of a soon-to-be-13-years-old boy, Jeremy Fink, going on a quest to find ‘The meaning of life’ that his late father left while experiencing a lot of things on the way. This book is so inspiring, so wonderful that I got completely swept up in my emotions while I was reading it. I seriously recommend you read this A waft of poignant feel of losing the loved one runs through the entire book. It’s delightful, yet I felt somewhat bittersweet vibe in this book and I absolutely adored it. This book is so inspiring, so wonderful that I got completely swept up in my emotions while I was reading it. I seriously recommend you read this book and see and experience firsthand what Jeremy and his best friend, Lizzy go through. The plot may come across hackneyed and old, but both the main two characters – Jeremy and Lizzy – are well fleshed out and their dynamics add a lot to the enjoyment. The banter they exchange while on their little quest is so fun and delightful to read. In this story, they are to find the keys – four keys – to open the box his father left. The whole sequence of their attempts to find the keys and the encounters they have while looking for the keys are so beautifully and enchantingly described, there was never a dull moment at least for me. Although this book is targeted at middle grade readers, this little book is, again, too good to be regarded as one of those kid’s books; it’s far from it. This book is pregnant with a deeper meaning and it teaches and reminds us what shapes us as a person and the importance of being fully in the moment, paying attention to our surroundings and making the most of our lives. Self development seems to be one of the themes of this book and in that regard, I so enjoyed seeing how Jeremy and Lizzy develop themselves as a person as they go. I am simply amazed by how beautifully every small detail of the plot falls into place and entwines. This is a perfectly-crafted, incredibly exciting read; this is a breath of fresh air. Every time summer rolls around, I feel a strong urge to pick up this book, sit down and read it. The summer that I experienced in this book left as big an impact on me as it probably did on both Jeremy and Lizzy. This story is about a boy named Jeremy Fink who got a gift for his 13th birthday. On this box it said "The meaning of life" and it had a lock on it. He got this girft 1 month before his birthday though and it was from his father who died 5 years ago. There was also a letter that came with this gift and it was from a lawyer. The lawyer was to give to Jermery for his 13th birthday but the key got lost and there was no replacement. Jeremy was the type of boy who didn't leave New York City but his n This story is about a boy named Jeremy Fink who got a gift for his 13th birthday. On this box it said "The meaning of life" and it had a lock on it. He got this girft 1 month before his birthday though and it was from his father who died 5 years ago. There was also a letter that came with this gift and it was from a lawyer. The lawyer was to give to Jermery for his 13th birthday but the key got lost and there was no replacement. Jeremy was the type of boy who didn't leave New York City but his neighbor Lizzie told him to go on a serach for the keys. They both look for the keys fast because they want to have them before his 13th birthday. This becomes a huge adverture for the two of them and they learn many lessons along the way. I thought this book was amazing. I love the way both of them were not so fortunate but worked together so everything would work out. This book really grabbed me and I left like I was in the story. I kept wondering what could of been in this box and I liked how both characters went through an adventure to find out. The contrived plot of this book made it hard to really enjoy as an adult reader, but as a teacher, it actually helps. Let me explain: In this book, Jeremy Fink is a 12-year-old who receives a mysterious box that his father, who died several years before, had arranged to be delivered to him the summer before his 13th birthday. It requires four keys to open, but they are missing. In it, according to a note from his father, is "the meaning of life." Jeremy and his best friend, Lizzy, end up looking The contrived plot of this book made it hard to really enjoy as an adult reader, but as a teacher, it actually helps. Let me explain: In this book, Jeremy Fink is a 12-year-old who receives a mysterious box that his father, who died several years before, had arranged to be delivered to him the summer before his 13th birthday. It requires four keys to open, but they are missing. In it, according to a note from his father, is "the meaning of life." Jeremy and his best friend, Lizzy, end up looking for keys--any keys--that might open the box. Along the way, they get in trouble while looking for the keys, which leads to meeting many people who help them on their quest. Honestly, it was hard to decide between a 2 and 3 star. Overall plot and story, 3, wrap-up - 1 or 2. Jeremy and his best friend Lizzy are great. Their story, the little mystery/adventure they embark on, all interesting and good. Here's my issue. You don't title a book with "...the Meaning of Life" unless you really have something good as the meaning of life. Or a really good reason why the meaning of life becomes the journey or something like that. However, when you have one really important dea Honestly, it was hard to decide between a 2 and 3 star. Overall plot and story, 3, wrap-up - 1 or 2. Jeremy and his best friend Lizzy are great. Their story, the little mystery/adventure they embark on, all interesting and good. Here's my issue. You don't title a book with "...the Meaning of Life" unless you really have something good as the meaning of life. Or a really good reason why the meaning of life becomes the journey or something like that. However, when you have one really important dead person imparting the meaning of life to their teen son - it had better be GOOD. And it wasn't. It was nice. It was "hope you had a nice day" hallmark card nice, but it wasn't great and it wasn't the meaning of life by any stretch. In fact, there was no "meaning" there was just some colloquial style comments about enjoying the moments in life etc. I bought this for my son, but it was so cute, I found myself reading it long into the night. It's been awhile since I read a kids' book that didn't insult the intelligence of the child reading while also respecting parents' wishes and keeping foul language, overt sexuality, alternate lifestyles or disrespect for certain political or religious beliefs out of the equation. This one is for EVERYONE. Here, you have some extremely well-written characters, loads of humor, a c Kid-safe. Mother-approved. Here, you have some extremely well-written characters, loads of humor, a compelling story with a message delivered PERFECTLY that should not be offensive to today's society's many differing belief systems. In short, it's a fantastic read you can be comforted in seeing your child read and the story is so interesting, the characters so real, they'll have a hard time putting it down. If you go along with the flow of life, without trying to change others, or change situations that are beyond you, life is much more peaceful. I gave this book five stars because it has a lot of mystery and it is basically a huge puzzle that they have to solve. I can also easily visualize the characters thoughts and the setting. An incredibly touching story, I don't think I'll think about life the same way now. No full review this time, I won't do it justice. 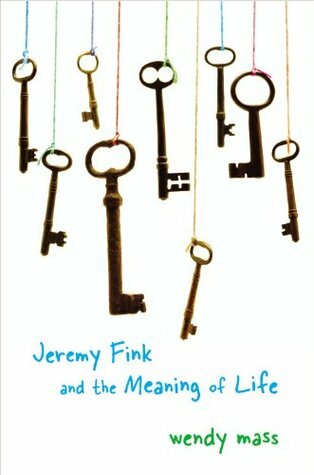 Jeremy Fink and the meaning of life is a book recommended for ages 11 and up. Jeremy Fink is a 12 year old boy and his best friend’s name is Lizzy. Lizzy and Jeremy do everything together. Jeremy and Lizzy live in the same apartment in New York City. Jeremy’s dad gave him a box to open on his 13th birthday which is coming close. Throughout the story the two best friends have to find the keys (that they don’t even know exist) to open the box. While they are on th Jeremy Fink and the meaning of life is a book recommended for ages 11 and up. Jeremy Fink is a 12 year old boy and his best friend’s name is Lizzy. Lizzy and Jeremy do everything together. Jeremy and Lizzy live in the same apartment in New York City. Jeremy’s dad gave him a box to open on his 13th birthday which is coming close. Throughout the story the two best friends have to find the keys (that they don’t even know exist) to open the box. While they are on their hunt to find the keys they get put in community service for the whole summer, write about what they are observing, plus they have to do an act at the state fair where Jeremy’s grandma lives. Will this stop them from finding the keys and opening the box to see what is inside it? Read the book to find out! É uma história bonita, bem contada e correspondeu exactamente às expectativas que eu tinha quando o encomendei. It's a nice story, properly told and it closely matched my expectations. I enjoyed the progression of this book. To me, one of the underlying messages was 'everything happens for a reason', which is something I wholeheartedly believe in. Jeremy's curiosity and innocence, which is something that can often be missing from children his age, made him an interesting character to see grow. I thought some of the puberty references at the end were a little out of place, but they didn't hinder the story. This review has been hidden because it contains spoilers. To view it, click here. Jeremy Fink is about to turn thirteen when he receives a package in the mail from his deceased father. He opens it and discovers a box – locked in four different ways – with the inscription “The Meaning of Life” on its cover, accompanied by a note to his mother from a law firm saying that they are passing the box on as per request (for Jeremy to open on his thirteenth birthday), but that the keys have been lost somewhere along the way. When Jeremy’s best friend Lizzy hears this, she comes up wit Jeremy Fink is about to turn thirteen when he receives a package in the mail from his deceased father. He opens it and discovers a box – locked in four different ways – with the inscription “The Meaning of Life” on its cover, accompanied by a note to his mother from a law firm saying that they are passing the box on as per request (for Jeremy to open on his thirteenth birthday), but that the keys have been lost somewhere along the way. When Jeremy’s best friend Lizzy hears this, she comes up with a plan to help them locate the keys. Unfortunately her plan nearly lands them in jail and they are sentenced to community service with a Mr. Oswald – a pawn shop owner who has some mysterious deliveries for them. Jeremy and Lizzy learn a lot about life through the deliveries they make and the people they meet – they also find the keys to the box and at last discover the message that Jeremy’s father left for him when he died – prematurely – at the age of 39. Spoiler: It’s all an elaborate set-up and game – Jeremy’s dad was a playful man. Mr. Fink wanted his son to know that life is precious and short and that friends and time well-spent are important aspects as you never know what time will be given to you. It’s crazy coincidence that he himself died after a fortune-teller told him that he wouldn’t make it past his 40th year. Wendy Mass. If only she wrote adult literature. As it is, the main complaints I have from reading "Jeremy Fink & The Meaning of Life" come down to it being targeted at young adult readers. For example, the length with descriptions puberty process; the easier words; the elaboration on topics adults have already been educated on! the tendency to overtell rather than show. Obviously, this is necessary to be categorized and to make it readable for the targeted audience. Another complaint is the Wendy Mass. If only she wrote adult literature. As it is, the main complaints I have from reading "Jeremy Fink & The Meaning of Life" come down to it being targeted at young adult readers. For example, the length with descriptions puberty process; the easier words; the elaboration on topics adults have already been educated on! the tendency to overtell rather than show. Obviously, this is necessary to be categorized and to make it readable for the targeted audience. Another complaint is the unbelievability of much of the plot- beginning from the elaborate "Operation: Jeremy Fink & The Meaning of Life", the way his father was able to find so many people whom actually came through with some difficult things, his conviction he would die at forty based solely on an Atlantic City Fortune Teller (he actually died at thirty-nine). I did really like how the keys were orchestrated, set up to guide Jeremy. Have to admit that the ending was unexpected. And appreciated. Too often, young adult especially, are written with predictable endings. Alas, I do of course need to evaluate young adult books according to what it ought to set out to do. And Wendy Mass definitely does this. Enough adventure and fun to keep the reader engaged, even read for hours straight. What had me super impressed with Mass was the aspects that actually seemed above-typical-young-adult-level, namely science, like time machine possibilities, time, space, matter, our miniscule presence in the universe, antiques and the subculture of the pawning industry, the best way to investigate (detailed observations, organized written clues, patience, analyzing the possibilities, no matter how minimal). There was also the mystery/adventure aspect that also helped to keep readers, adults included, engaged. How can anyone not be immediately drawn to a book with an opening sentence like that? Jeremy Fink and the Meaning of Life documents the life Jeremy Fink and his best friend, Lizzy, as they attempt to find the keys to a box that contains the meaning of life. Along the way they discover important things about themselves, their friendship, and of course life. They also encounter many unique characters that will aid them on their search and leave a lasting impressio My sweat smells like peanut butter. Jeremy Fink and the Meaning of Life documents the life Jeremy Fink and his best friend, Lizzy, as they attempt to find the keys to a box that contains the meaning of life. Along the way they discover important things about themselves, their friendship, and of course life. They also encounter many unique characters that will aid them on their search and leave a lasting impression on their lives. I really enjoyed this book, as I was instantly intrigued with the lives of Jeremy and Lizzy. Wendy Mass does a wonderful job describing the characters of her novels to the point that you feel that you know them in real life. Besides the obvious fact that I am a female, I felt that their friendship was very close to the friendships that I had when I was 13. I can also relate to Jeremy when he thinks about the universe and his place within it, because every now and then I still feel a little lost. Wendy Mass is great writer, the characters were completely believable and fun. At first, I thought the plot was a bit too contrived until I got to the end and realized it was supposed to be contrived! The ending saved it for me and I was happily satisfied. Jeremy Fink is about to turn 13 and hoping to discover the meaning of life. About a month before his birthday, he receives a package in the mail containing a unique box that needs four specific keys to be opened. The craziest part is that the box is a gift from his father who died five years earlier. Jeremy and his best friend Lizzie make it their summer mission to locate the missing keys, unlock the box, and reveal the late Mr. Fink’s message to Jeremy. This book had so many things to love. Fir Jeremy Fink is about to turn 13 and hoping to discover the meaning of life. About a month before his birthday, he receives a package in the mail containing a unique box that needs four specific keys to be opened. The craziest part is that the box is a gift from his father who died five years earlier. Jeremy and his best friend Lizzie make it their summer mission to locate the missing keys, unlock the box, and reveal the late Mr. Fink’s message to Jeremy. Anyway, this book is a really perfect summer-in-middle-school book. It features a weird kid and his weird friend, but the great part is throughout the book you realize that everyone in this kid's neighborhood is as weird or even weirder than him. It is great. It is a book that makes grownups actual people. Each adult in this story has their own beliefs and their own outlook, which comes to light as the main character Jeremy Fink asks them about the meaning of life. From a famous scientist to a boardwalk preacher, they all answer differently, really demonstrating how everyone's opinion is different, and how everyone must reach their own truth. The main driving force behind the story, which is a box Jeremy receives the summer he is due to turn 13, is a clever device but the ending makes it all a little bit contrived. It's a nice ending that wraps up a lot of questions, but it left me unsatisfied. However, I really enjoyed the journey to the end of this book. Yes, some of it comes off as the author trying to impart Big Life Lessons to the kids reading it, but that was not a problem for me because I liked the characters and the setting so much. My best friend and I set off on our bikes determined to go further than we ever had before. The wind whipped my hair off my face and nervousness, joy and excitement rippled through me like heat waves off the asphalt. We were having a blast. That wasn’t so much fun. Jeremy Fink in the book, Jeremy Fink and the Meaning of Life, by Wendy Mass, is the opposite of me. He likes comfort so much he won’t even eat anything other than peanut butter sandwiches and macaroni and cheese. It is My best friend and I set off on our bikes determined to go further than we ever had before. The wind whipped my hair off my face and nervousness, joy and excitement rippled through me like heat waves off the asphalt. We were having a blast. Jeremy Fink in the book, Jeremy Fink and the Meaning of Life, by Wendy Mass, is the opposite of me. He likes comfort so much he won’t even eat anything other than peanut butter sandwiches and macaroni and cheese. It is hard for Jeremy to be adventurous until the day he gets a box from his now-dead father that has the words engraved in it: The meaning of life: for Jeremy Fink to open on his 13th birthday. The box is missing 4 keys to open it and Jeremy goes on a quest to find them with his best friend Lizzy. Lizzy is like a sister to Jeremy. Her mother left when she was a baby and Jeremy’s family is like her adopted family. Lizzy has issues with stealing items when her hands “get itchy.” She doesn’t like to sit for long because she doesn’t want to think deeply about things. When she has to start using her brain she steals stuff and starts to run. Lizzy’s stealing doesn’t make sense in the beginning and I remember reading it and asking myself, “Huh? Why would she do that?” I also thought Jeremy was weird just eating peanut butter sandwiches. I thought his Mom only made him that as a meal but Jeremy wouldn’t eat anything else. I remember thinking these are two strange kids but their actions become clear at the end of the story. Jeremy’s Dad leaves the two of them a wonderful message in the box. You’ll have to read the book to discover what it is! An old man is teaching his grandson about life. “A fight is going on inside me," he said to the boy. "It is a terrible fight, and it is between two wolves. One wolf is evil. He is anger, envy, sorrow, regret, greed, arrogance, self-pity, guilt, resentment, inferiority, lies, false pride, superiority, and ego. The other wolf is good. He is joy, peace, love, hope, serenity, humility, kindness, benevolence, empathy, generosity, truth, compassion, and faith. This same fight is going on inside you - An old man is teaching his grandson about life. “A fight is going on inside me," he said to the boy. "It is a terrible fight, and it is between two wolves. One wolf is evil. He is anger, envy, sorrow, regret, greed, arrogance, self-pity, guilt, resentment, inferiority, lies, false pride, superiority, and ego. The other wolf is good. He is joy, peace, love, hope, serenity, humility, kindness, benevolence, empathy, generosity, truth, compassion, and faith. This same fight is going on inside you - and inside every other person, too." Ah, a Classic Wendy Mass story. Reading this as a sixth grader had me jumping out of orange-red Lebron 13 Special Edition basketball sneakers. I started the book, and it was actually ok! I mean, a confusing plot and the characters jump from here to over there but overall an O.K. read. I would give it like a 3.5, but there is no feature for that. But still, a great read if you want something to fulfill your "boxy" (Jeremy Fink pun) needs. This review has been hidden because it contains spoilers. To view it, click here. It was an ok book. I thought that it needed a little more action and pizaz. I do not like the end of the book when Jeremy finds out it was all fake. It honestly broke my heart to find out the whole book was a lie. It was pretty good but very, very unique. “A fight is going on inside me," said an old man to his son. "It is a terrible fight between two wolves. One wolf is evil. He is anger, envy, sorrow, regret, greed, arrogance, self-pity, guilt, resentment, inferiority, lies, false pride, superiority, and ego. The other wolf is good. he is joy, peace, love, hope, serenity, humility, kindness, benevolence, empathy, generosity, truth, compassion, and faith. The same fight is going on inside you." The son thought about it for a minute and then asked, "Which wolf will win?"